Lotus revealed today the new 2014 Exige V6 Cup, which is a road-legal racecar and the Lotus Exige CupR, which is a pure race-bred vehicle. Both the 2014 Lotus Exige V6 Cup and the CupR are going to have their world debut at the 2013 Autosport International show this year. The 2014 Lotus Exige V6 Cup develops 345 hp at 7,000 rpm and 400 Nm / 295 lb ft of torque at 4500 rpm. With a weight of just 1080 kg, this is enough to launch the 2014 Exige V6 Cup from nought to 62 mph (100 km/h) in just 3.8 seconds. Its top speed is rated at 274 km/h / 170 mph. Naturally, it has a 6-speed close ratio transmission. The equipment list of the 2014 Exige Cup includes AP-Racing four-piston calipers with ventilated and cross-drilled 2 piece discs, an aerodynamically optimized front splitter, rear diffuser and wing and a sport exhaust with a bypass valve. Lotus also equips the new Exige Cup (2014) with a FIA approved roll-cage, and a 6-point race harness. The 2014 Lotus Exige V6 CupR develops 366PS at 7200rpm and 413Nm/295 lb ft of torque at 5000rpm. However, it has the same performance figures as the Cup version. 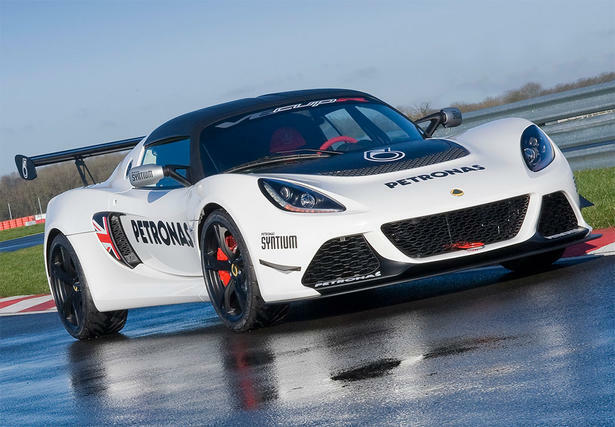 Lotus did not yet announce the prices for the new Exige Cup models. The full specifications of the 2014 Lotus Exige V6 Cup are available here, while the CupR's specs can be found here.